The Tibetan system of astrology is a combination of Indian and Chinese methods, the greater and most essential (spiritual) part derived from the Chinese, and the technical element coming from the Indian system. The Indian or technical part (ephemerides, lunar tables, etc.) is called Kar-Tsi, and the Chinese, or spiritual part, is called Jung-Tsi. The Tibetans, who are short on calculation ability, borrowed whatever planetary tables they use from the Indians, and do not depend upon these planetary ephemerides for much of their system. They make great use of the 12-year cycle of the animal signs plus the fivefold element sequence (wood, fire, earth, iron, and water) as used in the various forms of Chinese astrology (Jung-Tsi). The Kar-Tsi came from the Indian system, along with the Kalachakra system. The quintessential portion of the Indian system of value to the Tibetans is the division of the lunar month into 30 equal parts, called tithis in the Indian system. Tibetan astrology is lunar-based, with the Sun (and all the planets) taking a secondary position to the Moon. One’s Tibetan birthday is not the same as one’s solar birthday (or yearly return), but is in fact the lunar phase-angle day on which one was born. Thus one’s birthday would be celebrated on whatever day of the lunar month the birth took place. Astrologers in general enjoy manipulating cycles and numbers. The Tibetans make up for their lack of planetary calculations with the manipulation of the various cycles they do use. In Tibetan astrology, numbers are counted forward, backward, and around in many different combinations. It is a complicated procedure that requires an astrologer. The net result of the Tibetan calculation is quite similar in effect or portent to western methods. The chief exception to this generalization is the use of the lunar cycle in day-to-day life. It is here that the Tibetan system excels and has a great deal to offer Westerners, while in the West the awareness of the lunar cycle has largely been lost. The manipulation of the animal signs, elements, parkhas, mewas, etc., takes considerable skill in calculation and even more expertise in interpretation. What results is a somewhat complex system that claims to explain the status quo, but, like its Western counterpart, allows so much interpretation that firm conclusions can seldom be drawn. It has been the view of Western observers that the East has a tendency toward fatalism and resignation to what fate has delivered to them. For instance, many Tibetan lamas and teachers are not particularly interested in astrology, outside of using the lunar cycle to plan and time events. To the Buddhist mind, personality makeup is not of great importance. For, no matter what that makeup, good or bad, the remedy remains the same: mind practice of one form or another. In fact, throughout the East, there is little interest in personality psychology as there is in the West. Those in the East have no need to flirt with the deeper areas of the mind, but have long ago been introduced to them, and take them as a matter of course. Keep in mind that reincarnation is the accepted belief system in both India and Tibet and, for that matter, the greater part of the world. A key belief of theirs is continuity of consciousness. In the West, the awareness of cycles is not self-evident to the majority. Astrologers attempt to bring it to the public’s attention, yet society has not come to such a conclusion, much less pushed toward a solution. Buddhist countries, long trained in the analysis of emotions and desires, have little interest in reexamining emotional and personality issues, which have been clarified in ancient times. Instead, the interest in expanding the awareness of the person (happy or sad) beyond such personal issues, and focusing on the root of problems and sufferings is assumed, beginning in childhood. Here are several of the major calculation techniques used by the Tibetan astrologer. Diagrams like the Turtle’s Head are common in writings on Tibetan astrology. Often this diagram is shown drawn on the underside of what is called the Celestial Tortoise. This tortoise represents the universe of both China and Tibet. The upper shell is the dome of heaven, while on the underside is inscribed the essential elements of the astrological mandala. This diagram contains the wheel of animal signs, the elements, and directions/colors. The wheel of the animal zodiac is ancient, arising somewhere in central Asia, and later incorporated by the Chinese. The calendar used by the Chinese is said to have entered Tibet in the year 642 c.e. by way of the Chinese Princess Kong-jo, who married the first Buddhist king of Tibet. These years are not measured from either one’s birthday or from January 1 of any year. Instead, they are measured from the beginning of the Tibetan New Year, a fluctuating point that marks the new moon that is nearest to the beginning of February. It is important to note that on occasion, the start of the Tibetan and Chinese New Years differ by an entire month. The animal of one’s birth year is central to both the Tibetan and Chinese systems of calculation and is the most common form of counting time. The 12-year animal cycle repeats itself from year to year. Each of the Tibetan signs, like Western zodiac signs, has its own qualities. The following is a very brief description of the 12 signs as taken from some of the Tibetan manuscripts. Mouse: The mouse is quiet. He is not friendly or outgoing and tends to be stable. He is not rough. Even though he does good to others, others do not seem to respond. On the outside, he is open and relaxed in appearance, but inside he is very strong and critical. Very open-mouthed, he says what he thinks. He is kind, but not generous. He misses the big opportunities, and takes the small ones. He is always searching. Ox: The ox is a difficult person. He is hard to get to work, and is not obedient. He likes to sleep. He often exhibits bad behavior. While it is hard to change him, he is most often an agreeable person. However his slogan is “Don’t mess with me!” He is very slow and does not care much if things are satisfactory or not. He postpones everything. He is good tempered. He likes to eat and sleep like a bull. Tiger: The tiger is brave, active, and bright. Always proud and loyal to close relatives, he tends to have rough behavior and speech. He does a lot of thinking. He likes gambling and makes a good businessman. Hare: “I am just for myself.” The hare is independent and does not need or ask others for their help. “I can survive. There is much opportunity in the world to be enjoyed. I am satisfied with that.” He tends to be indirect, devious, and possibly dishonest, but always skillful. He is stingy, but smiles and is generous on the surface. Possible diseases include those of the stomach and gall bladder. Dragon: The dragon is neither brave nor active, but is good. He never does bad. “I am not very powerful, but nobody harms me.” He does not make much effort, but also does not procrastinate or put things off. When the time comes, he does his duty. He has a short temper, but is good-minded. He is talkative. He listens to others talk. He has trouble containing himself. He has less disease than some of the other signs but if he gets sick, it can be serious. Snake: The snake has a bad temper and is always burning his own mind stream. However, he has a good heart and is very optimistic or forward minded. Even if others are jealous of him, no one has the power to put him down. He can, however, destroy himself. He may have a somewhat rough character and can be mean. Once his mind is made up, he will not change it. He tends to diseases of the stomach and liver. Horse: The horse is said to have miraculous power and is capable of great effort. Even though 1,000 enemies chase him, he cannot be defeated. His older life will be better than his youth. He listens to others. He likes horses. He is a fast walker and enjoys play. He has a self-sacrificing character and always helps others. He needs little sleep. His life has a lot of ups and downs. Sheep: The sheep does not talk much and tends to be not too bright. He can be a rough character. He likes to eat. He causes others no harm, but does not sacrifice himself for them either. He is generally good-tempered and good-hearted. Always relaxed, he does not rush. He is not lazy, but cannot get things done on time. He does not show either like or dislike. He is a good provider. Monkey: Monkeys are very smart, not very talkative, and tend to have bad tempers. They have lightweight, weak bodies. They are not always open-minded and are said to have “small” mind power. Not noted for their sense of responsibility, they like to play and enjoy themselves. Their words are not to be trusted and they talk, gossip, and tell lies too much—surface oriented. They look clean but tend to eat dirty things. Very ambitious, they always have great plans. They like to praise themselves. Bird: It is easy for the bird to lose his possessions, legacy, inheritance. They are always advising others, but seldom take their own advice. Possessing a very strong sexual desire, they always need company. They like to be neat and clean, and do not require much sleep. They are prone to blindness. They love style, dressing up, and tend to smile a lot. They enjoy walking and stylish movement. Good with friends. Dog: The dog is proud, mean, and somewhat wrathful. He cannot seem to get kindness from others no matter how hard he tries. He is self-interested, does only for himself, and never for others. His mind is always filled with lots of thoughts. He tries to do things right, but they tend to turn out bad or wrong. He likes meat. He is a fast walker. Very sexual. A traveler. He is high-or good-minded, and elegant people tend to like him. Pig: The pig is not bright. He likes to eat but is not concerned with what type of food. He eats everything. He likes yoga. He has good self-discipline. Can be greedy and often takes advantage of others. He does not benefit himself. He lies. He has a big stomach. He is good with the good people, and bad with the bad people. He seldom smiles and is often mean. He can be a rough character. Shi-Shey is the enemy of the fourth one. In addition, the fourth sign over from any given sign (either way) is called Shi-Shey and that is bad, too. The rest of the relationships of the signs are fine (e.g., triangles). The signs have different power or importance as shown in the following table. By far, the most important are the first four, which are similar to what are called cardinal signs in Western astrology. These signs rule the four major directions as follows: Tiger (east), Pig (north), Monkey (west), and Snake (south). The five elements are taken from the Chinese astrological system. Although somewhat similar to elements as used in Western astrology, the five elements of Eastern astrology are much more defined and depended upon. They are a major factor in Tibetan astrology. Like the animals signs, the elements also rotate in strict sequence from year to year, but unlike the signs, each element holds for two years before changing. Thus, the elements and signs rotate in combination, the total cycle taking 60 years. The elements are: Wood (air), signifying long life, beauty, good or increasing energy, mental energy, changeable, and not stable; Fire, signifying strong, instant, hot, and warmth; Earth, signifying stable, strength, and ground; Iron, signifying strong, cutting, direct, weapon, changing (it is somewhat similar to earth); and Water, signifying soft, fluid, clear-seeing, flowing, and smooth (often connected to the blood and emotional concerns). Each year is assigned an element. These elements rotate in a particular order. Each year’s element is the son of the previous year’s element. In other words, the previous year is considered to be the mother of the following year. The relationship table shown below is read as follows: Wood is the mother of Fire, Fire is the son of Wood, Water is the enemy of Fire, and Fire is Water’s friend. There are preferred relationships between the elements. Mother is the best. Son is the next best. Friend is less important, but acceptable. Enemy is the least desirable. Certain elements go (or do not go) well together. Earth and Water are good, while Wood, Iron, and Fire (in combination) are not as good. Regarding these major elements, the life force is the most important of them, for both sexes. It represents the life strength or élan vital (i.e., how one holds one’s life). Then comes the power element, how one overcomes obstacles and achieves goals. This is of special interest for women. The function of power is spontaneous, instantaneous. Bodily health, physical health, or sickness is important for all. The luck element, also called “wind horse,” is special for men, while soul, which is somewhat similar to the life force but more concerned with the emotional or psychological state, is not used very much. The life force is determined according to the following table. The left-hand column is the animal for the current year, while the right-hand column is the element for that year’s life force. The Soul Element is always the Mother of the Life Force Element. Use the Relationship Table to determine this. The months always start with the dragon month, which is the first month or Losar (Tibetan New Year), no matter what the year. Each month has an element that is calculated by taking the son of the year’s element and making that element go with the first month’s sign, Thus, 1988 is the earth dragon year, and the son of earth is iron; therefore the first month is the iron dragon month. Elements are used twice each, so the second month of the year will also be an iron month, and then two water months, and so on in rotation: iron, water, wood, fire, and earth followed again by iron, water, wood, fire, and earth, and so on. The beginning of the next year does not continue the rotation, but starts afresh. In the earlier Tibetan system, which is still observed for certain calculations, the year started with the new moon prior to the Winter Solstice rather than Losar. That moment began the first month, which always took the sign of the tiger, with the other signs following in normal rotation. The elements also start with the calculation of power element for the element of the current year. That power element is then used. Each day of the month depends on whether the month is a male (animal sign) or female month. (The male signs are mouse, tiger, dragon, horse, monkey, and dog; the female signs are ox, hare, snake, sheep, bird, and pig.) For all months that are under a male sign, take the tiger for the first day of the month and proceed in strict animal sign rotation to the end of month. For female months, take the monkey and proceed in animal sign rotation. Either way, the rotation ends at the end of the month and the next month’s first day takes either the tiger or monkey as a starting point. The first day of the next month depends on the gender of animal sign, etc. The element for each day is derived by taking the son of the month’s element (as described earlier). However, in the case of days, elements are used singly and not by twos (as in the case of the months). Start at sunrise and go for 12 hours by two-hour sections. The first two hours after sunrise belong to the hare and each two-hour section follows in strict animal sign rotation. As for the two-hour elements, take the son of the element for the day (described earlier) and use the elements in single rotation (one only, and not two each). Sunrise is determined, when there are no exact calculations, as the moment when the lines on the palm of one’s hand can be seen. Taken from the I Ching or Chinese Book of Changes, each day has a morning and evening parkha or trigram. Combined, these parkhas give a complete hexagram for that day that can be used to consult the I Ching. The triangle of tiger, horse, and dog start on the first day of the month with Li. The triangle of mouse, dragon, and monkey start on the first day of the month with Kham. The triangle of bird, ox, and snake start on the first day of the month with Dha. The triangle of pig, sheep, and hare start on the first day of the month with Zin. The parkhas then follow in strict order, one for each day of the month. The descending parkha for the current year is counted differently for male and female persons. For males, start with the parkha Li and count clockwise; females start with the parkha Kham and go counterclockwise. The count, in either case, is to the “agesign,” or the number of years from birth to the current year, starting with the birth year as one. Thus, the agesign in 2003 for someone born in 1941 is 63. Once the descending parkha for the current year is determined, refer to the following table to determine the good and bad directions for that year. There are four good directions: Nam-Men (sky healer), which is the best one and is particularly good for doctors; Sog-Tso (healthy life), which is the next best and good for sleeping (one should point his or her head in this direction); Pal-Key (generating, glorious), the third best, is the best direction from which to buy or obtain things; and Cha-Lon (bringing auspiciousness, prosperity), which is the fourth best, and is good for traveling. The four bad directions are: Lü-Chey (body destroying), which is the worst direction and should be avoided; Dü-Chö (devil-cutting), which is second worst; Dre-Gna (five ghosts), which is third worst; and Nö-Pa (evil spirit), which is the least worst. The birth parkha is also important. To find the birth parkha, it is necessary to calculate the descending parkha for the mother of the individual for the year of the individual’s birth. The Gu-Mik, or ninth-eye spot, is calculated as follows: From the birth sign, every ninth sign is Gu-Mik. The parkha Gu-Mik, or ninth spot, with male persons is Li, which is not very good for that year and marks a transition. With females, the same is true for Kham. In addition, Mewa Gu-Mik is when the birth mewa is the same as the current year’s mewa. For signs Tiger and Hare, use descending Parkha Khon. For signs Horse and Snake, use descending Parkha Khen. For signs Bird and Monkey, use descending Parkha Gin. For signs Mouse, Pig, Ox, Sheep, Dog and Dragon, use descending Parkha Zon. If the descending Parkha of the current year is any of the above for the particular signs, then those signs have a year that is Dur-Mik, which is not particularly good. Mewa means “mole” or “birth mark,” and the nine mewas stem from a system of numerology used for centuries by the Chinese. It indicates a karmic relation from life to life. There are nine mewas, and they are often arranged in a so-called magic square that gives totals of 15, whichever way they are totaled up. These nine mewas are counted backwards starting with the wood-mouse year (1, 9, 8, 7, 6, etc.). An entire circle consists of three 60-year cycles. The current major cycle began in 1864 and will end in 2044 (1924 and 1984 were turning points). The 180-year cycle counts backwards until the year before the wood-mouse year in the third cycle, which is the water-pig year. At that point, the mewa for that year is made to be (2) black, thus making ready for the following year to be (1) white and the start of a new major cycle. Here are some very rough translations as to the general meaning of the nine mewas. Traditionally, a birthmark is associated with each mewa, a probable length of life, a specific dharma practice, and mantra for that mewa. 1 White: The length of life is 71 years. There will be four difficult times during the life. A birthmark or mole is on the right side. Is left-handed. The practice involves obtaining a Chenresik statue (loving, kindness, and compassion) and practicing this sadhana. The mantra is: “Om mani padme hum.” Either an only child, or only one child turns out useful and carries on the generation. He travels a lot. Good in social work, where others are benefited. If a male, then brave. If female, then a strong one. Could have three children. Likes to move about here and there. Snakes are their protector. Difficult with children, meaning: not so good for the kids—things happen to them. Possessions and jobs are very unstable. He is bad tempered, but has a good mind. A difficult early life, but the longer the life, the better it gets. He is a clean person physically and likes white things like milk, butter, etc. 2 Black: The length of life is 61 years. There will be three bad periods. There is a birthmark on the right hand or arm, the heartside, or the neck. The practice is that of Vajrapani, which is strength and the clearing of obstacles. Become like the vajra—indestructible. Get a statue of Vajrapani or a stupa. Mantra: “Om vajra pani hum.” If the child is first-born, it will be easy to care for him, an easy child. Is often sick when a child. He has nice speech, but a bad mind. He has a dark appearance, mean and horrible. Always sad. He tries to do good things, but no one likes him. If a monk or a member of the Bon religion, then he is a very strong practitioner. He likes meat and alcohol. He has many friends, whom he loves but seldom has an opportunity to be with them—and thus no result. If sick when an adult, will be hard to cure. 3 Blue: The length of life is 50 years. There are three difficult periods. There is a birthmark on the calf of the left leg. The suggested practice is that of Vajrasattva (dorje-sempa) practice. Vajrasattva purifies and removes the limitations, obstacles, and imperfections of the mind. Mantra: “Om vajra sattva hum.” He likes to sleep. He has a strong mind, but there is much instability in his life. He is a little bit greedy. At work, he is not able to concentrate, and tends to skip around. If male, he will talk less, and if female will tend to be sad. He is difficult to change. Blame comes even if he does good things for others. He may have many wives (husbands) but no children. He will go to and die in another country. He may have paralysis. 4 Green: The length of life is 65 years. There are four difficult periods. On either thigh is a black circle birthmark. The practice is that of Vajrapani, which is strength and the clearing of obstacles. Become like the vajra—indestructible. Get a statue of Vajrapani or a stupa. Mantra: “Om vajra pani hum.” He should avoid funerals. Cleanliness is very important; else the nagas (snakes) give a bad disease. He likes to travel. He has a deep mind, but is sometimes bad. Perhaps difficulty having children. If he has property, then farmland. The life is unstable, with a lot of ups and downs. There is sadness sometimes. People gossip about him. He does good things but others get the credit. He does not like to be lower than others, but finds little opportunity to rise. Whatever he has inside, stays with him. The nagas are his protector. He is a vegetarian with four children. No wedding. 5 Yellow: The length of life is 50 years. There will be two difficult periods. His birthmark is a certain nervousness. The suggested practice is that of Shakyamuni Buddha, called the diamond vehicle, cutting the vajra. Mantra: “Tadyata om mune mune mahamuni shakyamunaye swaha.” This is a dharma person. This is also the astrologer’s mewa. A monk’s monk. He was a monk in the last life, reborn into a noble family in this life. Here is a very devoted person, with a stable mind. Very intelligent and religious. Obedient to his parents, he follows their customs or carries on their traditions. He does not travel much, or go far from his birthplace. He has a protector coming from his ancestors, whom he has ignored, and who is thus a little bit angry. He has strong dreams because his protector is angry. He is hard to please. Before becoming a monk, he was a saint, also a normal dharma teacher. He talks a lot, but often misses the point. He is very smart, a quick thinker. Should be a religious person in this life. He is restless, moving here and there. He has very high expectations of others. He always helps others, but they become his enemies. They gossip about him. He has five children. He has wealth in the form of property, houses, land. He will live long if he is religious. He is virtuous and educated. His possessions can be somewhat unstable. If female, he gets more gossip from others. If he is angry, it is difficult to please him. He has a good and stable mind. Tends to diseases of the gall bladder, heart attack. 6 White: The length of life is 70 years. There will be five difficult periods. There is a birthmark on the calf of the left leg. The practice suggested is that of the long-life (and purification) deity Vijaya Vsnisa (Tsuk Tor Nam Gyal Ma). Mantra: “Om amrita a yur dade swaha.” He is intelligent. His mood and appearance are always changing. He travels a lot. If female, then will have nice speech, but the mind is not good. Receives protection from his own local deities. Possibly, he could be very poor. He will not be living near his birthplace, but instead, elsewhere. He will be able to build himself up greater than his parents. He is seldom sick, but if sick, he will be hard to cure. He has many relatives, none of whom offer him much help. There will be many enemies. He does good for others, but is still blamed. He will have three to five children. Children possibly handicapped. There is not much power in the family, but wife is powerful. He is quite bad tempered. 7 Red: The length of life is 80 years. There will be four difficult periods. A birthmark is on the backside or chest. The practice is that of tara (green Tara), and thus healing, protection, wealth, and a good birth. Mantra: “Om tare tuttare ture swaha.” If female, then she likes to sleep. If married, it will not last long. He likes to fight, has a strong body and a ruddy complexion. Possibly may succumb from a sudden disease. Could die from his love of meat and similar things. His generation always shows suicide and murder. Seven children. The life very unstable. 8 White: The length of life is 50 years. There are three difficult periods. A birthmark is on the right cheek. The suggested practice is that of Shakyamuni Buddha called the diamond vehicle, cutting the vajra. Mantra: “Tadyata om mune mune mahamuni shakyamunaye swaha.” He should avoid dirty things, stay clean. There is protection by local deities. He could go to another place from where born. Pleasant but proud. Good hands for arts and crafts. Older life will be better than younger life. He is religious and virtuous. Could have four to six children. Elegant people like him. The bad people do not like him. Could have a tendency to gossip, causing bad relations. 9 Maroon: The length of life is 73 years. There are five difficult periods. There are birthmarks on the face, neck, or left leg. Suggested practice is that of Manjushri, the development of the mind and intellect. Mantra: “Om ara patsa na dhi.” An image of one holding seven glorious flowers in hands. If he keeps flowers well, then will be a very rich man. Could be proud or greedy. His older life will be better than young life. Very brave. He may well live other than where born. Wealth includes cows, animals, livestock in general. Has to keep his wealth with care or obstacles could destroy it. This is a good mewa for females, but not for monks or Bon. The birth mewa is calculated by counting backward using the current year’s mewa in the center up to your agesign. Note that birth year here means the year as measured from the Tibetan New Year, which is approximately the new moon nearest February 1 of the year. The result is the birth mewa. The current year mewa equals the birth mewa. If the current year’s mewa is the same as the birth mewa, that is said to cause the current year to be a little difficult. This is also true for birth mewa and current year’s descending mewa—if the same, then that year is not as good. Another much used calculation is the descending mewa. To calculate one’s descending mewa, place the birth mewa in the center of the magic square and count from the center to the east (left) one number. Then, count counter-clockwise if the birth zodiac animal is a male sign and count clockwise if the birth zodiac animal is a female animal zodiac sign. Count to the age sign with the first count (the center) counting as number one. The result is one’s descending mewa. When counting, always remember that in the Tibetan system, a person is one year of age at birth. So one is always added to one’s Western age. Good (in descending order of goodness): 1, 8, 6, 4, 5 (1 being best). Bad (in descending order of badness): 2, 3, 9, 7 (2 being worst). The mewa 2, 5, and 8 are ruled by the Tiger, Monkey, Pig, and Snake. Start counting from (1) White. The mewa 1, 4, and 7 are ruled by the Mouse, Horse, Bird, and Hare. Start counting from (4) Green. The mewa 3, 6, and 9 are ruled by the Ox, Sheep, Dog, and Dragon. Start counting from (7) red. These above mewa always occur with these signs. For the above signs, start counting with the indicated mewa, and count each day of the lunar month in a forward (1, 2, 3) direction. For example, the first day of a snake month would start with (1) White, and move forward. Log-Men means not turning back or not coming back. This is calculated differently for males and females. For males, always start with the sign of the tiger and, for the element, take the son of the birth power element. Remember, each element is counted twice. The sign and element combination that corresponds to your age sign is the Log-men. Females start with the monkey sign and use the mother of their birth power element and count in reverse direction to the current agesign. That sign and element is their Log-Men. For males, if Log-Men is the sign Dog then it is called Nam-Go (Door of the Sky), while if the sign is Pig then it is called Sa-Go (Door of the Earth). If Nam-Go, then it is important to avoid climbing, high places, etc., for that year. If Sa-Go, then avoid digging, foundation work, under ground, and the like for that year. For females, the sign of the Dragon marks Nam-Go and the sign of the Snake marks a Sa-Go year. This is a very integral part of the Tibetan astrology system, a means of awarding zeros (good marks) or X’s (bad marks) for the current year to one’s major elements: Life force, power, bodily health, luck, and soul. This is also part of Keg-Tsi, which is the yearly calculation of the life obstacles. The day after the new moon is the first day of the month and whatever day of the week it is color the whole month with the tone or quality of the planet of that day (sun for Sunday, etc.). Also, the son of the first day’s element is equally powerful for that whole month. The mother of that element is medium powerful, and the friend or enemy is bad for that entire month. Example: If Sunday is the first day of the month (as above), then every Sunday in that month is very powerful, but if Sunday is friend or enemy (or otherwise not very good), then it dampens the best day of the month. Further, if the first day of the month falls on a Sunday, then the planet is sun, and the element fire. Therefore, the son of fire is earth, and earth is powerful for the month. The mother of fire is wood, so wood is medium powerful that month. The friend of fire is iron, and the enemy of fire is water. Fire and water are bad for that month. Certain days of the month are auspicious and inauspicious for a given person. There are three favorable days each month, called foundation days, power days, and success days. There are also three unfavorable days, called obstacle days, disturbance days, and enemy days. In general, it is advised to begin things and take care of important business on the favorable days, and avoid such enterprises on the unfavorable days. The numbers in this table refer to the lunar days of the month for each sign. Lunar days 1, 2, 26: Good for making offerings, requests of high personages, taking vows, religious practices, and, in general, the obtaining of something desired. Lunar days 3, 11, 20, 23: Excellent days for strong, firm actions; good for beginning construction or obtaining high offices. Lunar days 4, 13, 16, 25: Days of quickness, clarity, skill, and cleverness; indicative of success in competitions. Lunar days 5, 8, 17, 18: Very bad reaction days; unethical activities will succeed, moral action will not. Lunar days 1, 9, 10, 19, 24: Generally good for activities such as marriages, large purchases, collections, teaching, initiation, blessings, building, and ceremonies in general. Lunar days 2, 15: Barren. Many events will not occur. Neither good or bad for building, meditation practice, and certain ceremonies. Nothing should be undertaken between midnight and 3 a.m.
Lo-Sar (Tibetan New Year) is the nearest new moon to February first. If there are two new moons, then take the second one. Lo-Sar is the first sunrise after the new moon, the next day. In the above table, numbers three through eight are good and nine through twelve and one through two are bad. Numbers three and four are the worst of the good ones, five and six are medium good, and seven and eight are the best of the good. Likewise, numbers one and two are the best of the worst, nine and ten are medium bad, and eleven and twelve are the worst of the worst. Note that the father’s death year sign, if same as the current year, is not very good. If descending Parkha is the same for both husband and wife, this is also not very good. This is true of family members in general. One might expect that a year that has the same sign as one’s birth year would be luck or auspicious. That is not the case in the Tibetan system. If one’s birth sign and the current year sign are the same (every 12 years), then this is an example of Lo-Khak, which is very inauspicious. For men, the year before a Lo-Khak (termed NangKhah) is a little more difficult than the Lo-Khak itself; for women, it is the year after Lo-Khak (termed Chi-Khak) that is difficult. If the current year sign is the seventh or opposite of the birth sign, this is called Dun-Zur and is also bad. If the current year is the fifth sign (i.e., Dragon-Monkey), then this is also not good. If the current year is same element as the birth element, then this too is not very good. Shi-Shey refers to the signs that are four up and back from the birth year sign. If the current year is either of these signs, then it is called Shi-Shey, which is not very good. Also, for the current year sign, count four up and four back and the months of that year with the same sign are called black months. 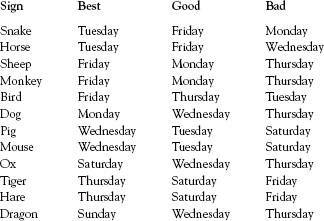 If these months are Tiger, Monkey, Pig, or Snake, then the whole month is black, but the first ten days are the worst, the second ten days a little better, and the last ten days better still. If the month signs are the Mouse, Horse, Bird, and Hare, then the days of the month from tenth through the twentieth are the bad ones. If the month signs are Ox, Sheep, Dog, or Dragon, then the last ten days of the month are bad. All days are calculated from the new moon. If the current year is Tiger, Monkey, Pig, or Snake and if the year’s mewa is (2) Black, then the whole year is a black year. Quite a bit is made of the so-called seven obstacles. Each of these eventualities affects the entire current year, from Lo-Sar to Lo-Sar. In the following list, “Current year sign” refers to the animal zodiac sign for the current year. Erlewine, Michael. “Lunar Gaps.” Matrix Journal (1990). Erlewine, Michael. “Science and the Lunation Cycle.” Matrix Journal (1990). I feel it necessary to start this discussion of Tibetan astrology by describing several concepts that readers will need to better understand this material. More than just an East-West sort of thing, Tibetan astrology is inextricably bound to Tibetan Buddhism. There was little or no mention of Tibetan astrology. Which leads me to the other main point that I must present before we can discuss Tibetan astrology, and that is meditation. Well, in Tibetan astrology, the primary educational tool is learning to use your intuition in a direct and practical way. To wrap up my personal history on this subject: As an astrologer who was also now studying Buddhist psychology, I continued to be fascinated by Tibetan astrology. I set up a workshop here at Matrix and John came and gave a seminar on Tibetan astrology in the early 1980s. Sange Wangchuk spent 2 1/2 years with us and, during that time, we translated a lot of Tibetan astrology from the original manuscripts. Physicians train for seven to nine years at the Tibetan Medical and Astrological Institute studying traditional Tibetan medical literature, grammar, languages and politics, as well as Tibetan astrology. A Brief Introduction of Buddhist and Tibetan Astrology. Combine mystery with astrology and I couldn't wait to set time aside to explore this detailed book on Tibetan Astrology. Tibetan Astrology is quite complex and needs an understanding of the cultural and spiritual history of this mysterious country.